How to re-subscribe to OnePageCRM? 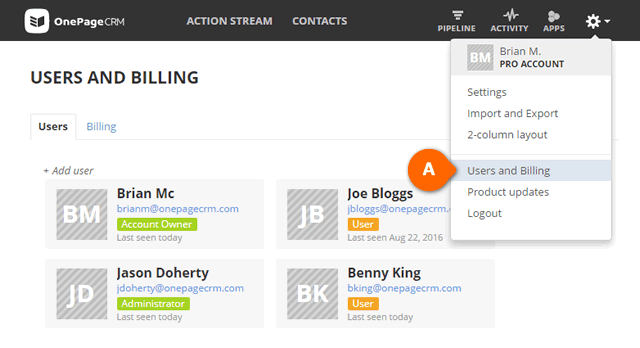 Access your OnePageCRM account. ONLY Account Owner's can access the account. Go to gear icon > Users and Billing (see A). 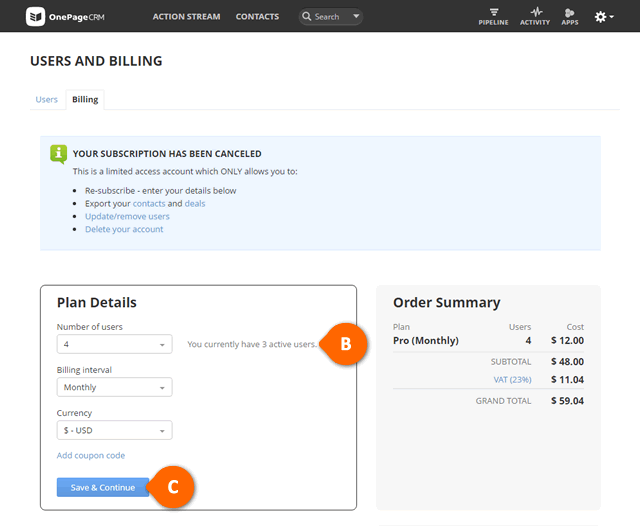 Under Billing, your previous subscription plan details are displayed. In Plan Details section, select your preferred Number of users and/or Billing interval (see B). Click Save & Continue (see C). In the expanded Secure Payment section, enter your credit card details, tick I have read & accept the Terms of Service and click Pay now. You successfully re-subscribed to your OnePageCRM plan and your card is charged immediately. Currency is set to your initial preferred currency. This cannot be changed when resubscribing.